tap photo in any tweet to see User Details - or tap “My Profile” to see your own! How do I Reply, Private, ReTweet, Email, Copy, Instapaper, Favorite, Save or Delete a Tweet? How do I add an account? Change accounts? To add account, tap “Add Account” in the lower tool bar. Simply select an account to make that the active account. How do I scroll to the top of the tweets? Simply tap the top tool bar twice! Tap once to page up. How do I page down in tweets? Double-tap the text of any tweet. How do find out more about/follow people? Any tweet which references someone eg @bbum can be double-tapped to bring up info on that user. You can see their friends, and their followers. You can start following them. You can read their latest tweets, look at their favorites and visit their personal website. You can bookmark them. To drill into their friends and friends of friends, simply tap the picture of one of their friends or followers! To get the giant picture of the user, tap the Photo in the upper left of the Detail panel. How do I update Twittelator to the latest version? Tap picture to get details! How can I reply to a tweet? How can I find out why I’m getting error messages? Under More, tap Log - you’ll see detailed server access information. And even things like how many server accesses you have left this hour. How do I shorten a long URL link while tweeting? How do I automate sending a URL from Safari? We prepared this step-by-step guide just for you! How do I open a web page in Safari? How do I copy a link in the browser? How do I email a link from the browser? How do I open ANY link from the browser? How do I go back a page? How do I send this page to Instapaper? 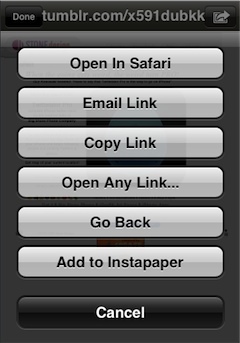 Tap the rightmost upper Action button in the built-in browser. 280 Dingbats - Cool - how do I get to them? First, while tweeting, tap the “heart and guy smiling” icon to bring up the last selected Dingbat panel. Now, see that "page control" dots above dingbats? tap on right to page forward, tap left to page backwards. You can also use a tap and drag gesture over the dots. You can also simply swipe left or right over the buttons to page back and forward. How do I respond a user and/or a private message? Given any tweet, you can tap on the photo and click the Reply arrow for a message and “Private” button for a private message. You can reply to a person mentioned in a tweet by double-tapping the tweet to see that person’s detail. Once your tweet is addressed, you can simply tap the light gray text which says eg “reply to twittelator” to make it a direct message (private), or toggle it from a Private message to a reply by tapping it again. How can I follow someone I don’t have a tweet for? Given any tweet, you can tap on the photo and then follow that tweeter. You can also follow any of their friends or followers by tapping on their photo in the detail of the tweeter. 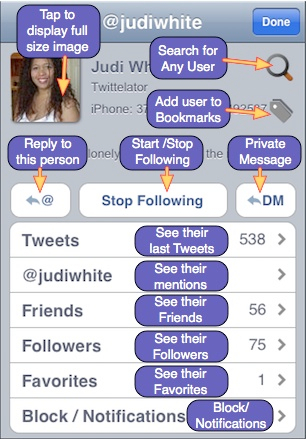 Any tweeter mentioned in a tweet you can follow by simply double-tapping the tweet to get the details of that user. If there are more than one tweeter mentioned in the tweet, you have your choice of which to get the details of. Again, in the details’ panel, you’ll see the Start Following button at the bottom. But, let’s say you meet someone in a café or bar and want to start following them. It’s easy: Tap “My Tweets” to find a tweet that you posted. Tap your own Photo to bring up your Detail panel. 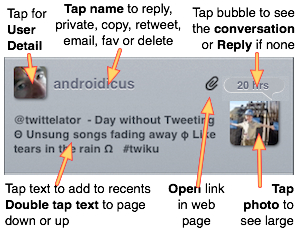 Your own detail panel has a special text field for entering Ad Hoc twitter screennames to follow. Enter their name and press blue Done button. How do I see the message someone is replying to? Tap the bubble around the time. This brings up the “Conversation” back and forth back to the first tweet that started the conversation. It starts a reply to tweeter if no bubble, or if in Conversation mode. Some hint or tip missing from here? For more FAQs - check here!